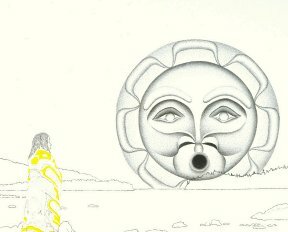 "Alaskan and Pacific Northwest Coast Totem and Wildlife Art-Art In Progress"
Art In Progress : "Tlingit Moon"
Many years ago I took a picture of someone. That serene image; that captured moment has stayed with me ever since. I had glimpsed a young Tlingit woman standing at the edge of a dense forest. 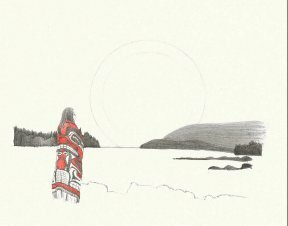 She had just finished her part in a ceremonial dance and was wrapped up both in her beautiful Chilkat blanket and her own personal thoughts. I sensed the specialness of that moment and hoped that someday I would experience it again. I think perhaps I will in this new composition. This is a stretch for me since I have primarily worked with wildlife and design and this particular drawing will have some technical complexities which I will have to overcome. We'll see. Please come back from time to time and see how it is progressing. This is one of several preliminary sketches for this 8 X 10 drawing. In my vision she has walked to the shore near her Alaskan village and is looking out on distant islands. A full moon rises in totemic form highlighting the peacefulness and majesty of her world. You can see the light outline of the moon in the background. Her blanket is red here but that was just an experiment. It will be the original golden yellow with a touch of green. Some of the background will change and I'm still debating on whether or not to make the sky a deep blue and the water dark or light. Just a few of the many compositional dilemmas. Here you see a practice drawing of the girl. There are things I needed to work out because ink and acrylic paint are finicky together. They don't play nice. If you have ink down first and then try to paint up to it or on it the ink will smear and run into the paint. So, the paint must be applied first. Once it dries you can stipple the ink right on top of it for shading and brush ink up next to it for darker blacks. I also needed some practice on her hair. 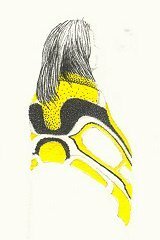 I can see this drawing taking several hundred hours to complete so I am concerned about keeping the yellow areas clean as I work on the rest of it. It's a departure for me to not only work with a human figure in the composition but also to include so much color. While in essence the drawing is still primarily black and white, the three colors will affect it significantly. I hope I can do her justice. This image shows you a section of the drawing that includes the rising moon in totemic form plus some initial work on the girl. There will be adjustments made to the moon as the drawing progresses since the addition of the sky (whether blue or black-still not sure) will dramatically change it's appearance. The shorelines, islands, and rocks are outlined and I'll begin working on them next. Drawing time to this point is 72 1/2 hours. Pointillism is time consuming work. I would love to hear any comments you might have about this drawing so please let me know what you think. I also hope to have signed and numbered, limited edition prints of "Tlingit Moon" in the near future. If you would be interested in one of those prints when they become available, click on the "Contact Us" link below and send me a message. I'll get a list together and keep you informed. Thank you for your interest in my work and for your encouragement. Note - The resolution setting on your computer may be keeping you from seeing these dawings as they actually are. Blacks such as those in the background of a drawing or the text on the page should be a solid deep black so if that is not what you are seeing, adjust your monitor's resolution to a darker setting. It's easy to do and you will like the difference you see.